Most of the “by losing, we really won” arguments from the BDSers defeated in last week’s Berkeley divestment battle are like this piece by Jewish Voice for Peace/Muzzlewatch Queen Cecilie Surasky, who substitutes the excitement of getting hundreds of people in a room to bash Israel for ten hours for actual political success. If such arguments rang a hollow ten years ago when groups like JVP begun providing a Jewish face to every BDS initiative on the planet, claiming unstoppable momentum seem positively bizarre after a decade of watching divestment fall flat on its face time and time again. Now there is one argument the boycotters are making that’s worth dissecting: their claim that they actually won a majority of votes in the Senate (16/20 in the original vote, and 12/20 in the veto override) and should thus be considered the winner of the democratic process (implying that their win was undone by undemocratic political maneuvering by their foes). Not that this argument holds any more water than the other ones they trot out, but it does open up some interesting discussions vis-à-vis BDS and democracy. For Berkeley’s student government (like the US government) is not an Athenian democracy (where all citizens/students vote on every issue), but is rather, like the US, is a constitutional representative system. Because the word “democracy” is used to describe these very two different kinds of systems, it can get confusing why simple majorities do not always get their way. Berkeley’s student leaders face the same conundrum as leaders from any representative government: is their responsibility to represent the people who voted for them, or to take positions without knowing what those constituents actually want? Fortunately, most decisions that fall into this latter category are ones where knowing public opinion is not vital. We elect leaders to manage a host of routine issues that requires that these representatives do the work we’d rather not (draft budgets, craft rules and policies, etc.). While not strictly “democratic” in an Athenian sense, trusting leaders to develop the expertise to manage these tasks is certainly more effective than having 35,000 Berkeley students show up the quad to ratify every budget line item by voice vote. But what happens when the issue under consideration is whether or not Berkeley’s name is going to be used to shore up a political statement about which student leaders cannot claim any unique insight or expertise? For example, can a majority of 20 Senators decide that Israel is guilty of war crimes via a mechanism that will be communicated around the world as the voice of the entire student body? In such cases, Student Senators face a higher threshold regarding knowing the will of the campus before deciding they can represent the conscience of that student body. So… Do those Student Senators possess (or did they acquire) unique insight into the Middle East conflict or international law before making pronouncements regarding which participant in the former was guilty of violations of the latter? No doubt anyone who gets into Berkeley is extremely clever, but such a description applies to all 35,000 students on that campus, many of whom are enrolled in the #1 or #2 History, Middle East Studies, Political Science, and Law programs in the world. Given this, it’s not clear that the Berkeley Student Senate has more information at its fingertips than 20 students randomly chosen off the quad. In fact, given the wealth of expertise the Student Senate could have tapped into to inform their decisions, it’s shocking to hear claims that participating in two all nighters consisting mostly of emotive testimony from partisans on both sides of the issue provided the education needed to make decisions on international politics and law in the name of every student on campus. For a vote of this nature in which the Student Senators were presuming to speak in the name of those they represent, knowing the will of those voters/citizens/students is critical to determining whether such a vote represented 12 or 16 out of 20 (a majority), or 12 or 16 out of 35,000 people with opinions on this matter (a tiny minority). That being the case, how can the will of the public be determined? Well one could put the whole divestment matter to a campus-wide vote, but this was already dismissed as too expensive. (It also opens up another challenge of whether or not the means to determine which question would be put on a ballot should also be put to a majority vote of the Senate.) Some type of professional survey could help us understand campus opinion better, but that too is expensive and would at best only provide a snapshot. If ASUC leaders had a mandate for their divestment vote (i.e., had campaigned on this particular issue and won) we would have certainly heard about it during the hours of arguments on the matter (we didn’t). But we do have some electoral data in the form of last week’s ASUC Presidential election which the leader and party most against divestment won handily. Add to this some substantial anecdotal data (including hundreds of people yelling at each other at marathon ASUC meetings, hundreds of comments appearing in Daily Cal articles and thousands of e-mails directly to student leaders) and I think it’s a fair conclusion that campus opinion on this matter is, at best, bitterly divided. And thus, those 16 or 12 leaders who voted “Yes” to divestment can make no claims to represent anything other than themselves. And this is where we get to the “constitutional” part of constitutional representative government. For such forms of government provide ways for the public to be heard if and when one part of that government seems to do something that does not represent public will. The veto wielded by an elected President is one such mechanism, as is the high threshold required to overturn a veto. In other words, the outcome last week is an example of student government working to make sure a bitterly divided campus was not represented as having one mind on the Middle East, simply because a dozen Student Senators said it did. Of course, the whole democracy argument rings a bit hollow from BDS advocates who cried foul when the elected board of directors at the Davis Food Co-op (an organization comparable to the Berkeley Student Senate in every way) rejected their boycott proposals unanimously. In fact, the few temporary successes BDS ever enjoyed (such as with the Presbyterians) only happened because divestment activists successfully appealed directly to leaders behind the backs of the people those leaders represented. I have yet to hear an argument about “democracy denied” by Jewish Voice for Peace, Students for Justice in Palestine or anyone else when those members rejected divestment by majorities of 90-100%. 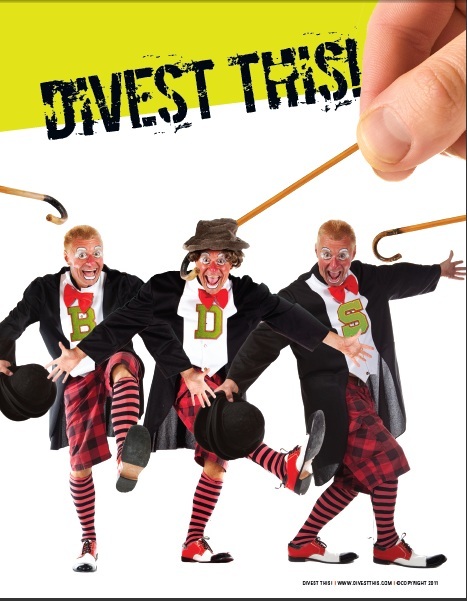 As ever, a discussion of divestment and democracy is far more interesting once you can get past the BDS formula which self-servingly states that democracy only manifests itself when they get their way. “Consideration of this resolution today will only prove again for us one thing: that it is divisive. It is dividing our students, pitting groups against each other who are fighting to be represented by their student association. They should not have to fight for the voice of our Association. We could not call any resolution approved through this process representative of the students at our university. And thus, I do not believe our student association can or should take a stance on this resolution.